A very delicate and easy to prepare trout dish, this Plank Grilled Trout will make your next barbecue a hit. 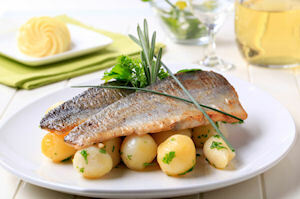 Tender trout is grilled on cedar planks until cooked through and falling apart. The cedar gives the trout a wonderful and earthy flavor, making this dish the perfect addition to any meal. Serve with potato salad, roasted vegetables or coleslaw for a truly memorable and delicious dinner! 2 (1-2 lb) whole trout, cleaned and gutted with heads, tails and fins removed. Place cedar planks in cool water and soak for 2 hours or overnight. Preheat grill to medium-high heat (approximately 400 degrees F). Brush trout, inside and out, with olive oil and season with salt and pepper. Place onto planks with belly side down. Place planks over indirect heat and grill until the fish reaches an internal temperature of 120 degrees, approximately 20 minutes. Remove from grill and sit for 5-10 minutes before deboning and serving.